The mobile phone has gained a lot of acceptance globally with Africa experiencing a lot of benefits from mobile subscriptions. Ericsson predicts that by 2019 there will be 9.3 billion mobile users globally. The company’s mobility report projects an increase in smartphone traffic with 5.6 billion subscribers using smartphone by 2019. Smartphones account for 25-30% of the global mobile subscriptions currently. These devices are however sold at prices that do not appeal to a large part of the African market. Ericsson forecasts a rapid uptake of smartphones in the Sub-Saharan Africa with the entry of low cost devices in the market. Another factor driving the adoption of smartphone is the increasing demand for content services with a big fraction of mobile traffic originating from cities. 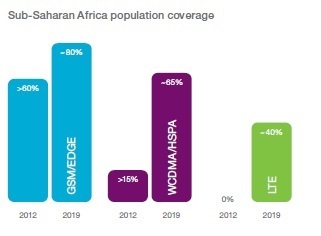 Mobile coverage stood at 70% in Q3 2013 for Sub-Saharan Africa compared 90% globally. The report projects 85% of mobile subscriptions in region to be GSM/EDGE-only. Currently the countries leading in mobile subscriptions are Nigeria, South Africa, Kenya, Ghana and Tanzania. Internet use in the region is predominantly through 2G-enabled technology. There is yet to be a great demand for LTE although it provides faster and efficient connectivity.